We are extremely confident in our service, you are in good hands! If you paid for any promotions we will contact you soon! If you submitted a giveaway and we find it to be good for our viewers we will list it. We would also like to mention that our submission service to 100+ sites will get you the best results. Last, If you are serious about thoroughly promoting your giveaway check out our promotions below! Bulk order discounts available – we work with blog/businesses who run giveaways monthly. We can negotiate a great discount if you plan on purchasing multiple promotions. Just bring it up when we contact you after you place an order. 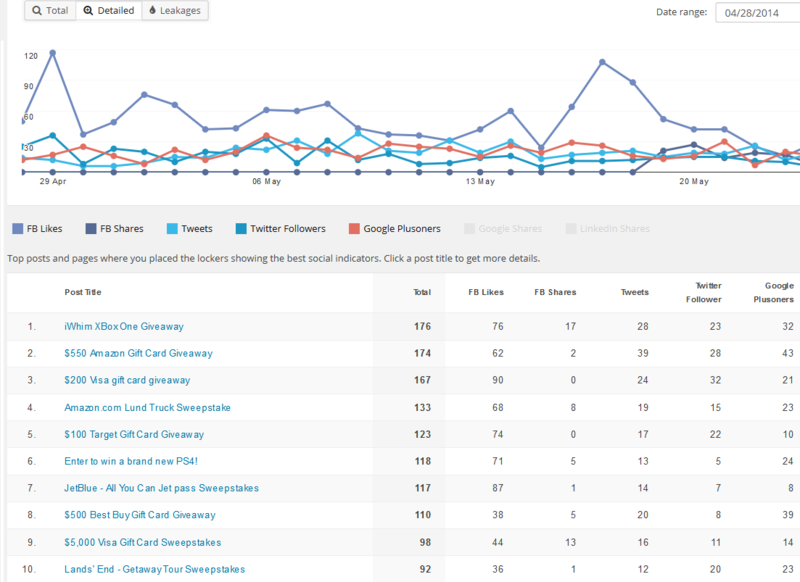 Our Promotions Really Drives Traffic! 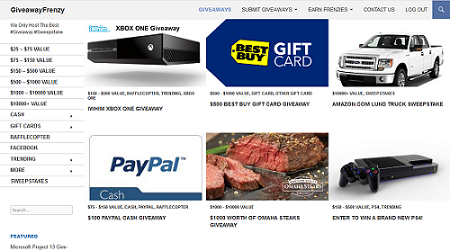 Besides listing awesome giveaways, GiveawayFrenzy is also a giveaway marketing service in partnership with Syndr. We promote giveaways for some of the biggest apps and businesses online. Our services include: submissions to 100+ giveaway, contest and sweepstakes sites, social promotion, social engagement and more. Giveaway Frenzy has done extensive research in Google Analytics reports for over 500+ promotions and submit to the sites that drive the most traffic to your giveaways. Want your giveaway submitted to 100+ Giveaway Sites? Our services submit your giveaway to 100+ giveaway, contest and sweepstakes sites, including the top 10. This package also includes 1 week of our Social Promotion Package. The more places you are listed, the more entries and exposure for your giveaway and brand. We submit to almost every giveaway, sweepstakes and contest site on the web including: Online-sweepstakes, Sweepstakes Advantage, and many more. Our submission service can easily get you thousands of more entries for only $57 for one submission or $97 to submit daily. Upgrade your listing to featured! Only $5.99 per week, we are ranked under 40K Alexa in the United States, plenty of traffic to give you some more entries. Upgrading can result in thousands of more views each day it is featured. These will be promoted on the left side-bar of all our pages! Lock Your Giveaway for viral sharing! All of our giveaways use our Social Fan Giveaway Locker which locks your giveaway until someone: Likes a Facebook or Twitter page, Tweets a message, shares your content on Google+, LinkedIn or Google+ your giveaway. This feature helps keep our service free to submit as we benefit from the viral sharing. We can switch our Giveaway Lockers to gain fans, followers and shares for you instead of us for just $7.99. View these awesome stats for our average 2 week giveaway we host. Are you interested in Social Promotion! It is only $9.99 per week and well worth it! 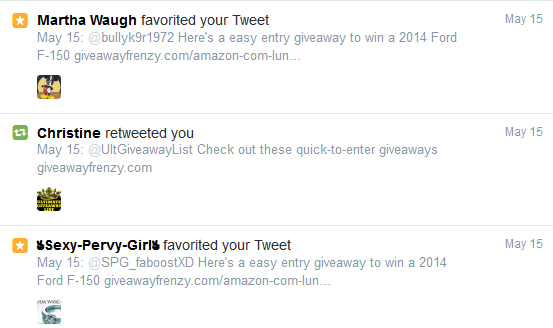 We promote giveaways better than anyone else! Take advantage of social media and increase social engagement as well as drive traffic directly to your giveaway via social media channels. Also increases your contests potential to go viral! Some sites charge more than us just to post once to their Facebook and Twitter Page, Here is where you will be promoted! For just $3.99 we will send over 2,000+ subscribers your giveaway. We receive a good percentage of traffic to our site via e-mail, purchasing this feature should make an impact with an average click-through rate of 18%!